Thank you for your interest in testing for the City of Goshen Fire Department. We have a standardized process that we use to select the most qualified candidates. You must be under 36 years of age and over 21 years of age with the following exemption: A veteran who has at least 20 years of service in the Armed Forces may become a member of the fund. The maximum age is 40 and six months to meet conditions for membership. 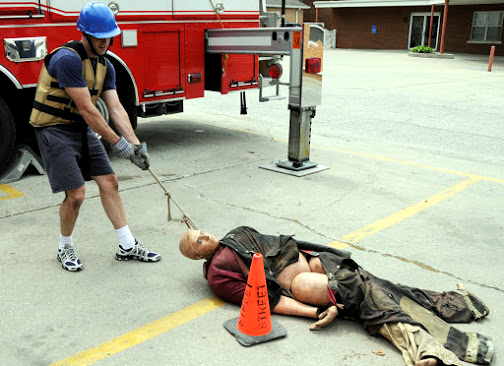 You must be an Indiana State Certified Emergency Medical Technician (EMT-Basic) by the time you are hired. You must have a valid Indiana driver’s license. Step 1: Fill out an application, by either stopping by the Human Resource Department at 204 E. Jefferson St. Goshen, Indiana 46528, or filling out the online application. 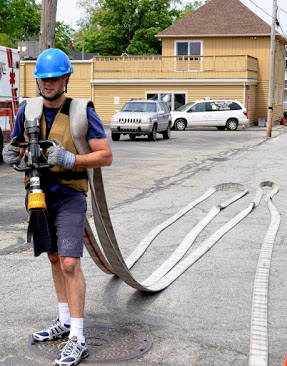 We test every year for a hiring pool that we will select qualified applicants out of for the following year. You will receive a letter, usually in mid-summer, to let you know when we will begin our testing. Step 2: Is completion of a written test. The written test will evaluate your reading comprehension skills. Test preparation manuals are available to pick up at the human resources office. Step 3: After obtaining a passing score on the written test, you will participate in the physical agility test. The physical agility test will evaluate your physical strength and endurance. Step 4: Is a comprehensive oral interview. You will be interviewed in front of the Fire Chief and members of our pension board. After this step, you will be ranked by a point system, and we will hire from this pool for the next year. You will not know the order in which you are ranked. If you are not selected and hired from the testing pool the next year, you will have to re-apply during the next testing process. 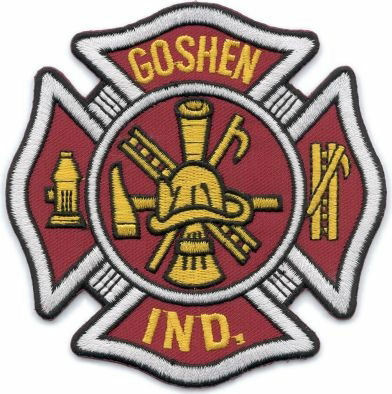 The Goshen Fire Department will be accepting applications for our 2020 hiring pool, after January 2, 2019. Thank you for your time and good luck! It is the policy of the City of Goshen to provide equal opportunity to its employees and all candidates for employment. Accordingly, the City will not discriminate in hiring or terms and conditions of employment on the basis of race, color, religion, gender, physical appearance, sexual orientation, gender identity, national origin, citizenship, age, marital status, veteran status, disability, or the known association with a known disabled individual. The City of Goshen participates in the E-Verify program to confirm the employment eligibility of all new employees. The E-Verify program compares information from an employee's Form I-9, Employment Eligibility Verification, to data from U.S. Department of Homeland Security and Social Security Administration records to confirm employment eligibility.